Danell Dvorak is a painter, ceramicist, and teaching artist. 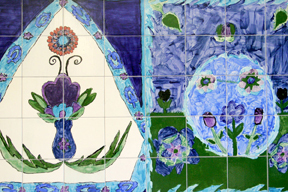 As artist-in-residence, she has led collaborative tile murals at the historic Proctor Recreation Center in Peoria and Springfield Ball Charter School, in addition to programs at the Tarble Art Center and schools in Carol Stream, Lacon, and Wenona. Her teaching experience includes workshops for the Illinois Migrant Council and Eastern Illinois University's Annual Art Education Conference, and courses at Heartland Community College and Eureka College. She has exhibited work most recently in national juried exhibitions, and has work in the collections of authors Andrei Codrescu and Carol Hill. Recipient of a Bloomington Cultural District grant, Dvorak was Education Coordinator at the McLean County Arts Center, and holds degrees from Illinois State University (MS) and Illinois Wesleyan University (BFA). From authors to architects, songwriters to sculptors, artists shape our ideas, spaces, and senses. Working as individuals within a creative, collaborative environment, residency participants learn to shape and share their experiences. My role as artist-in-residence is to involve, develop, and instruct participants as they work towards expression through a visual medium. Whether exhibiting my own work or facilitating others' work, I believe that art establishes an important dialogue between self and community. Through drawing, painting, sculpting, and working with clay, participants gain entry into this dialogue - and insight into themselves. Together, we can be as creative in the planning process as in the hands-on activities. By tailoring the residency to suit your organization's objectives, site, budget, and schedule, we will create a vibrant and meaningful learning experience.